If you are a teen of the 70's I know what comes to your mind at the thought of pea soup.... So don't go there. This soup is sooo good your kiddos will scarf it down in no time. I cook mine in the Crock Pot and all I have to do is make bread bowls. 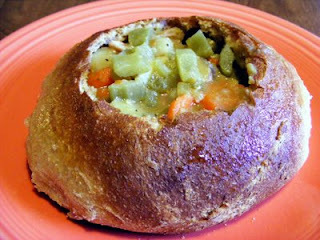 I will post my recipe for my tried and true bread bowls later today. We like shredded sharp cheddar cheese with our soup but some people like sour cream too. It feels like spring today on Beaty's Creek complete with thunder storm watches. Stay safe and enjoy this soup. Place all of the ingredients in a crock pot and cook on high for 6-8 hours.